Non-enveloped, bacilliform with a T=1 icosahedral symmetry, about 50 nm length and 20 nm large. Linear, ssRNA(+) genome of 4 kb. The genome contains four major and three minor ORFs. Genomic RNA serves as both the genome and viral messenger RNA. 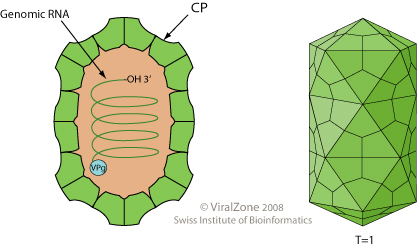 ORF2 is a polyprotein which is possibly auto-cleaved by the ORF2 viral protease. ORF3 encodes the RNA dependent RNA polymerase and may be translated by ribosomal frameshifting as an ORF2-ORF3 polyprotein. The single capsid protein (ORF4) is translated from a subgenomic RNA. Subgenomic RNA translation gives rise to the capsid protein precursor. ASSOCIATED DISEASES La France disease. TRANSMISSION Transmission is horizontal via mycelium and possibly basidiospores.